The following excerpt is from the great book called: Kundalini Yoga: The Flow of Eternal Power by Shakti Parwha Kaur. She is a dear friend and like a grandmother (just turned 80!) since I was a little kid. "Unfortunately, most parents, including yours and mine, have to depend upon their instincts and the parents they learned from their parents. Most of them are not yogis. They can only guide us within the limits of their own knowledge and experience. Even with the best of intentions, their own neuroses and biases color the way they teach us to deal with ourselves and the world. It is not only what parents say to us, but what they do and what they are that deeply affects us and forms our basic attitudes toward ourselves and everyone else. We in turn pass along this legacy to our children, consciously or unconsciously. Your first teacher is your mother. From the 120th day following conception (it is on your 120th day that the soul actually enters the womb) through the first three years of life, your mother’s influence dominates. She is the primary, powerful, most compelling shaper of the attitudes, habits, prejudices, relationships, and self-images that usually stay with you for the rest of your life. For better or for worse, your mother’s influence is almost indelible. The umbilical cord lasts well beyond the womb. The seeds of growing up with fear of failure, or fear of success, are planted during these early years. Your second teacher is your father. From age three to eight, his impact predominates. He is the male figure (or absence thereof) who supplies the example, the role model for a son. Dad is the archetype to imitate, to love, or to hate. Father personifies "man." For a daughter, daddy or poppa is the standard which she will compare every other man she ever meets, for better for for worse. The third teacher enters our consciousness at about age eight, in the form of brothers and sisters, relatives, neighbors, teachers, friends. They take on a major role of influence in our lives. Peer pressure rears its ugly head, and continues to grow stronger until it becomes enormous during the teen-age years. Of course given ideal circumstances, peer pressure can be useful, supportive, and can encourage positive growth, but in most instances, it has the opposite effect. The forth teacher is your spiritual teacher. Most people born in the West don’t really know what a "spiritual teacher" is. We suffer from a collective cultural deficiency, i.e., lack of education about the nature and function of a spiritual teacher and the necessity and important of this relationship in our lives. Who does think he is. He has had the actual experience of confirming his identity beyond question. His mission in life is to help other people achieve that same experience. And when your soul leaves the body, he’s there to help you make the transition. He works more in the non-physical planes than on the physical. When you go mountain climbing, you hire a guide – someone who knows the way and the technology to get you to the top without falling and breaking your neck. He tells you where to step. You have the choice of following his instructions or not. You have that same choice on your spiritual path. Your spiritual teacher is like the rope with the hook on one end that you can safely climb up on, because it’s anchored on the top. He offers himself as that rope. You have to project a link to it from your heart and then hold on! He takes on the weight of you and your karma as well as that of all the others he is helping reach the same destination. That link is never broken by the teacher, but the student has the option to let go at anytime, and many do. It is that link of the mind and heart which we create with our teacher that enables him to help us free ourselves from our past, from our pain, from our patterns of fear, jealousy, greed, and anger, which cause us so much suffering and keep us trapped in our lower consciousness. Yogi Bhajan is my spiritual teacher. Yogi Bhajan describes the student-teacher relationship: "Like a hammer and a chisel with a stone: when they meet, the sparks fly." The relationship of a student to a spiritual teacher has to be described in analogies, because it is fundamentally so different from any other relationship you have. The relationship is not between personalities, although to the student it can appear to be! A spiritual teacher is like a forklift who has to come down to earth, pick you up and lift you to the height of his level of consciousness. When he meets you, how you perceive him depends on your degree of consciousness. He can play whatever role you need in order for you to evolve. Life is a school. We can choose: We can either learn our lessons in the hands of Time or from a Teacher. Our spiritual teacher acts as a catalyst to accelerate the learning process. He saves us time (perhaps even lifetimes). He doesn’t necessarily make life easier, but he makes our growth as a spiritual being the main focus. He challenges us to fulfill our highest potential. He doesn’t, and isn’t supposed to, solve our problems for us, because that is OUR job. He gives us the tools and teaches us how to use them to cope with all the things we must face. He can suggest and recommend, but he cannot make our choices for us. In this Aquarian Age, it is no longer adequate to know about something, we have to experience it. A spiritual teacher is not a preacher. Lots of people can give fabulous lecture and quote plenty of scripture. A spiritual teacher gives you an experience. Could you please kindly guide me to the Gurbani shabad(s) where it teaches that the soul enters the body on the 120th day? Actually, this understanding has been known and experienced from pre-vedic times, way before the Siri Guru Granth Sahib was compiled. It was assumed knowledge by the times of the Gurus since it had been known already for over 5,000 years. You can experience it yourself. Talk to a spiritual woman whose intuition is strong and who has been pregnant. SIKHISM AND YOGA ARE TWO DIFFIRENT PHILOSOPHIES AND HAVE NO COMBINATION. Sikhism & Philosphies are academice subjects and we must be care-ful not try to hurt genuine Khalsa travelers on a Spiritual journey. Guru Granth Sahib is a Universal Guru for a Spiritual person of any path. Guruji is not exclusive to Sikhs or Sikh philosophers and academics. Guru Nanak Dev ji’s path is of love, humility, seva, simran, sadh-sangat and of course vand chakna. If a Sikh Yoga teacher like SSS Yogi ji succesfully helps people who were into drugs to lead a better life via Yoga, healthier eating and come in the guidance of Guru Granth Sahib besides the monumental cultural & language complexities…we should learn something from him before offering our judgement to 3HO Khalsa brothers/sisters. Devotion of Khalsa brother & sisters connected to 3HO foundation is very pure and genuine. 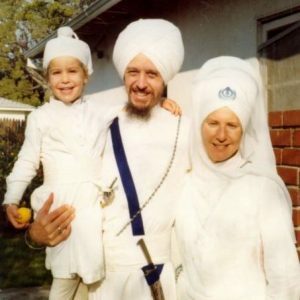 Many have their third generation still connected to the Guru Granth Sahib’s teachings even if they don’t do Yoga. If something is working (like Yoga) and helping people connect to Guru Granth Sahib what is the benefit of offering a judgement without a better solution… We are not helping but yes hurting for sure. Yes, Guru Granth Sahib ji does say that singing Kirtan in Sadh-Sangat is supreme compared other endeavors*. If one uses few minutes of Yoga/Breathing excercise to relax themselves b4 connecting to Gurbani/Shabad Guru or before singing kirtan it has its benefits. We got a slight taste of that @ Camp Miri. This a very important question, because we don’t take our answer from what was known in “pre-vedic times” or what was “assumed knowledge.” The Granth is a total rejection of this Vedic or assumed knowledge. Where we look for your answer is what Guru’s taught about the subject. In Guru Arjan’s day time was figured by the lunar calendar. So by the solar calendar, what the above states is that 9 months after the soul enters the womb (conception) you are born. i am jagjit kaur and study in bsc(i.t)-3rd year.can you please send me all the work that a sikh must do in a day. Actually it is word YOG, which means devotion ( BHAGTI ). The is no religion named HINDU.This is actually SANATAN MAT, which has SIX philosophies. One of them is PATANJLI’S YOG.It has 84 asans.According to some HINDU word came from SINDHU. What according to famous writter SIV LAL in his famous book DATE LINE PUNJAB, LIFE LINE SIKHS he said that hindu means THIEF in ARABIC. But there is no word yoga. i was born in a sikh but i was reintroduced to sikhism thru kundalini yoga.i believe people who critize others should first see where they r on the spiritual path.a person who is anywhere on that path would never ask for explanations.i have been practising kundalini yoga for a while & going to do tt this year that is not coz it is related to sikhism n we do recite from Guru Granth Saheeb but coz i am ready for it.i guess to know all this u really need to experience.just to cut it short i am a medical doctor as well.i can’t comment on 120 day thing ev never experienced it but do have a chance in future as i am woman but i guess a man can never experience that n no doubt women always can feel subtle things which sometimes take a lifetime for a man n even sometimes feel things n know things that ev not happened yet (intution)which i guess s strong in women sometimes we ev female patients coming to us n asking for check up n they even pick up pea size tumours.,no explanation not even in medical science any of the journals or anywhere.SATNAM!GOD BLESS ALL! Sat Sri Akal, With GOD’S grace i got chance to read your second comment. One and always one request i never put down any religion, even i have same respect to non believers,because we are all human beings, the crown creation of this universe. Second thing it never matters in which family you have taken birth, only thing matters what you are practicing. A person born in an illitrate family can get highest education.Perfactness can take birth in the house of imperfact couple. WITH DUE RESPECT I AM A PERSON OF GLOBAL BROTHERHOOD THOUGHT BECAUSE WE ARE ALL THE CHILDREN OF SAME AND ONE FATHER. WILL YOU SUPPORT THIS GREAT AND NOBLE CAUSE OF HUMANTARRIANISM. Please no need to say sorry, i have learned very much from your opinions. I wish your good health and i always wait your responses to my comments. Thanks for your greatness, Sat Sri Akal. I didn’t want to hurt anyone by my comments.I just wrote what I felt.sometimes it’s better to be quite.I am sorry if I hurt ur feelings but didn’t do it with an intention of hurting u. Thank you for your comments on SANATAN MAT. But I believe your statement: “You can not ride in two boats at a time.”, is most pertinent to this discussion. This topic is a very good example of the kind of dilemma you can find yourself in if you are straddling two boats. On the one hand you have Guru Arjan stating that the soul enters the womb at conception and then you have Yogi Bhajan stating that the soul enters the womb on the 120th day after conception. Both of these statements are at the opposite extremes concerning the issue of abortion. This is a cross roads where you have to decide which boat you want to be riding in. I know this post & its comments have been up for awhile, but I just read them recently. I would like to ask Guruka Singh or someone else who is a Sikh and also a Kundalini yoga practitioner to comment on what appears to me to be a discrepancy between what the Siri Guru Granth Sahib says about conception (the soul enters the womb at conception) and what Kundalini Yoga as taught by Yogi Bhajan says about conception (the sould does NOT enter the womb at that time but at 120 days after). Aren’t these two positions contradictory? And if so, why did someone who was a Sikh (Yogi Bhajan) put forth a position contrary to the teachings of his own Scripture? Where DID the 120 day belief come from and how is it tied in to Kundalini Yoga? I don’t think it’s enough to vaguely assert that the belief was widespread thousands of years before Sikhism — how did it come to be a part of Kundalini Yoga? I’m asking from a sense of genuine confusion — I would like to have this straight in my mind. I think it’s especially important in light of the fact that the 120-day theory is so widely accepted in Kundalini Yoga circles without much questioning. It’s even printed in the KY Teacher Training manual. Guru Ji uses a common allegory of his time here. The night is divided into military watches instead of hours, each watch representing the period for which sentinels remained on duty. Every three hours the watchman was relieved. The first watch = the first three months of pregnancy. The watches of the night allegory was also used by Guru Ji to indicate the three stages of every human life: child, adult, and old age. Nirvair Kaur has asked a good question and you have failed to answer it. The first watch is not the first three months of pregnancy. As can be seen in the quote that you used: the first watch lasts for ten lunar months (nine solar) and ends at birth. The second watch is childhood, the third being adulthood and the forth is old age. But the question raised by Nirvair Kaur is: how does a Sikh accept the 120 day concept or even teach it if it is contrary to what the Gurus taught. It is clear that even in the quote that you use, the soul enters the womb and nine months later you are born. That makes it perfectly clear that the soul enters the womb at conception. I can understand how a yogi can accept the 120 day concept but I find it difficult to understand how a Sikh can and so does Nirvair Kaur. It is from fourth week of pregnancy on that the heart of the embryo starts beating. Let me put it this way… through the mother's power of intention and prayer, even before conception, the soul can "put dibs" on the mother. When the conception takes place, the soul "reserves" its spot. The soul does not commit to the incarnation till the baby's heart begins to beat. At that point, although the soul has already been in the mother's sphere of consciousness, it commits to the incarnation. It's akin to signing a contract with intent to close the deal and then closing the deal on a later date. This was understood and experienced in pre-vedic times and the knowledge long predates our Siri Guru Granth Sahib Ji. Please understand that "Naa(n) satrai naa(n) mitrai" There is no distinction. It's all in one. Some know more, some know less. But there is no less or more. A big drop of water and a small drop of water – it's all the ocean. This is the ocean of wisdom and intelligence. This is gyan. This is Bhagwati. This is the experience of the Shabd Guru which existed through all time and before the incarnation of Guru Nanak Dev Ji. Anyone can tap into it. Sat Sri Akal,You have taken it in wrong way, i am not hurt,but which type feelings you have taken that is my gain and it is path towards perfactness because one never knows his short comings, you have to depend on others. So you have not hurt me but you have helped me. So i am very very thankful to you. Sat Sri Akal, Thanks very much, i have deeply gone on your precious words.As for as SOUL entering in the Womb of mother is concerned, my statement was based on some medical observation but what you have expressed in this comment on this issue, your opinion has convinced me and i am 100% aggre with you and i have learned a lot from your views. Thanks again for a great lesson on this subject to me. But i have said about two faiths SIKHISM and SNATAN MAT’S one philosophy out of six PETANJLI’S YOG. As Guru Arjan Dev ji said to Bhai Manj who was a leader of sakhi sarver and He told his wish to be a Sikh of Guru Jot. At that time Guru ji said that you can not place Sikhi on Sikhi. SO you can do justice at a time in one faith and with you and to people to whom you preach. In that prospective i have said that we can not ride in two boats at one time. I think i have clerified my point and your confusion. I will always wait for your precious words to improve myself. Sat Sri Akal. Jagjit singh mukandpuri Punjab India. WAHEGURU JI DA KHALSA, WAHEGURU JI DE FATEH, Sikhism condems the theory of INCARNATION. When we sikhs of Guru Nanak Sahib, Guru Gobind Singh JI and SGGS Ji we should talk according Gurumat, not as Manmat. WAHEGURU JI DA KHALSA, WAHEGURU JI DE FATEH. According to Vedic philosophy the soul enters the womb at conception. Without the divine presence of the soul there is no life. This 120 days philosophy is totally bogus. It is not yogic at all nor is it proper Sikhism.